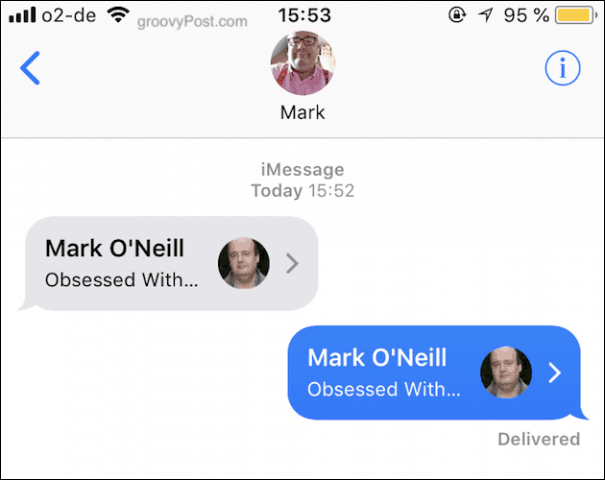 Sharing a contact from your address book is simple on an iPhone using iMessage or WhatsApp. Just follow these simple steps to learn how. 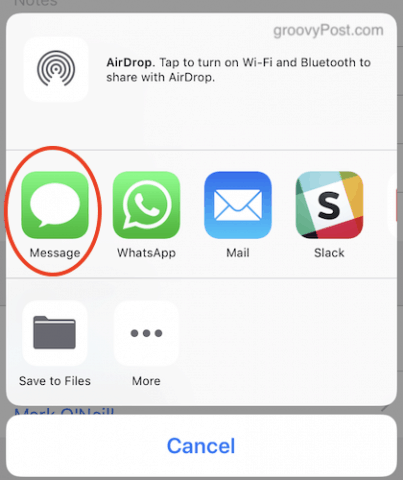 WhatsApp, and to a lesser extent, iMessage, are two of my favorite communication platforms for the iPhone. This means I try my best to make sure I have all of my contacts synced and up-to-date between the apps on my device. But sometimes, a contact is missing and if someone else (such as my wife) has the contact on her phone, we use the following process to share the contact between us. 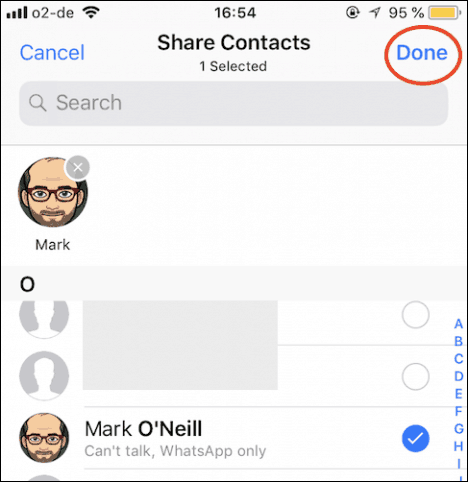 Both iMessage and WhatsApp have very similar methods for sharing contacts. But I will start with iMessage. So I hear there’s this guy called Mark O’Neill and he is a REALLY interesting guy to talk to. So I’m going to send over the contact details so I can talk to myself. Talking to myself is good. It’s the only way I can be sure of an intelligent conversation after all! 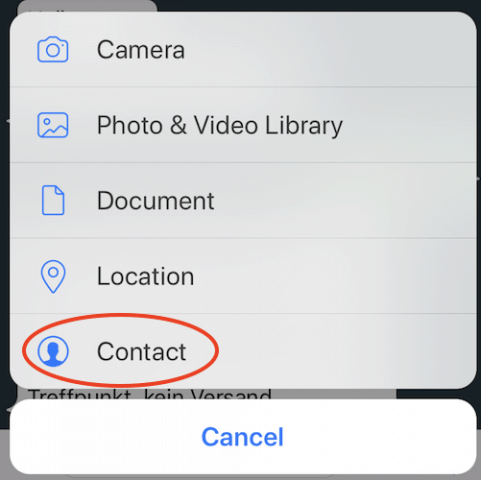 To send the contact, have the sender open the contact in the iOS address book or Contacts App. 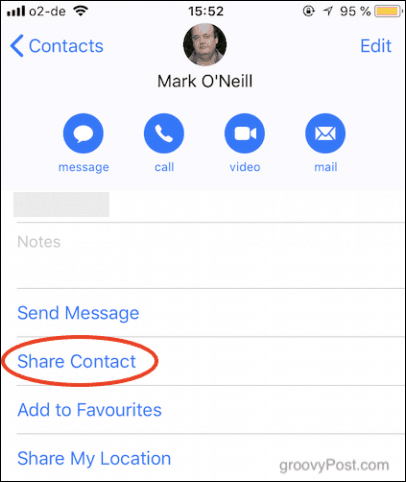 Scroll down to the bottom of the contact and choose Share Contact. 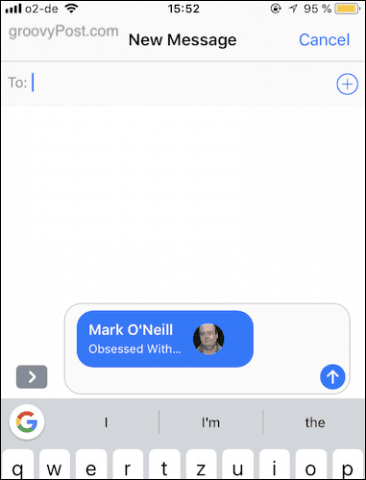 When the sharing menu opens, choose Message — this is probably the easiest method since it will SMS text or iMessage the contact. Once the SMS chat window opens, it will be pre-populated with the contact details inside a blue box. Simply address the text message, add a comment in the box with the contact (if you want) then click the blue upwards arrow to send it. Since I both sent the contact and received it, it appears twice in the screenshot below. Normally, however, it will just appear once on the receiver’s device. Tap once on the blue speech bubble window containing the contact and you will see the contact’s details listed. 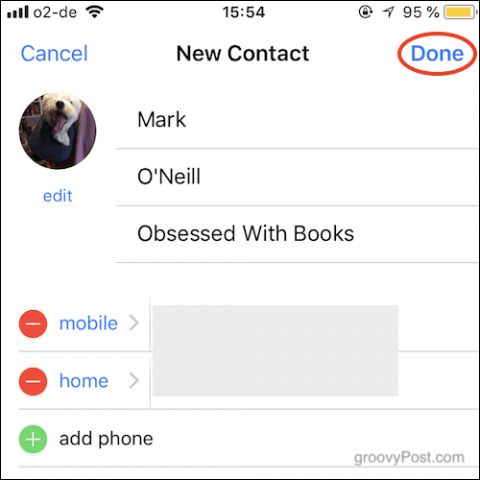 Scroll to the bottom and tap Create New Contact if it’s a brand new contact or tap Add to Existing Contact if you’re just adding additional info to an existing contact. You will now see a new entry in your iOS address book, pre-populated with the contact’s details. Feel free to edit the details if necessary, and when everything looks good, tap Done. The entry will now be saved to your iOS Contacts. As I said previously, sharing a contact via WhatsApp is very similar. When you get to step two above, choose WhatsApp instead of Message. 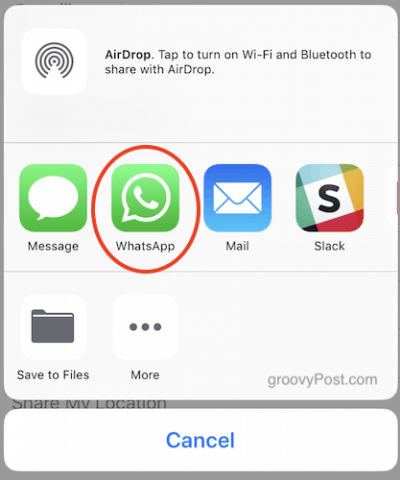 Alternatively, you can share a contact from inside WhatsApp without leaving the app. Just tick the “+” icon next to the speech box, and in the pop-up menu, choose Contact. Whatever method you use in WhatsApp, your contacts list will now appear. Scroll down and find the required contact. Then tap the circle to the right of it. A blue tick will now appear and the avatar of the contact will appear at the top. Click Done and the contact details will appear in a WhatsApp chat window, ready to send. Sharing contacts is one of those things where it’s fast and easy to do if you know where to look. 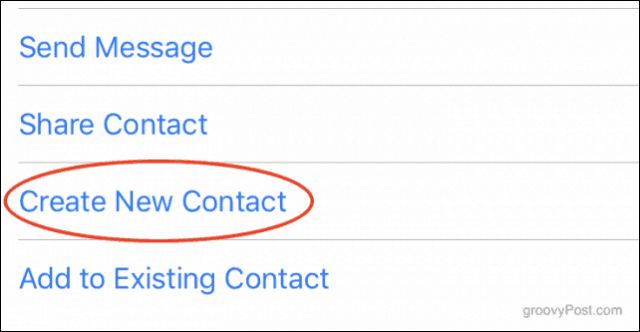 A lot of people I know have no idea this function even exists and instead spend time manually typing in new contacts. Although that works, it’s much slower and increases the likelihood of mistakes. What about you? Is this a new tip? We would love to hear from our readers on this tip and any other tips you use all the time on your mobile devices! What are Excel Formulas and Why Should I Use Them?